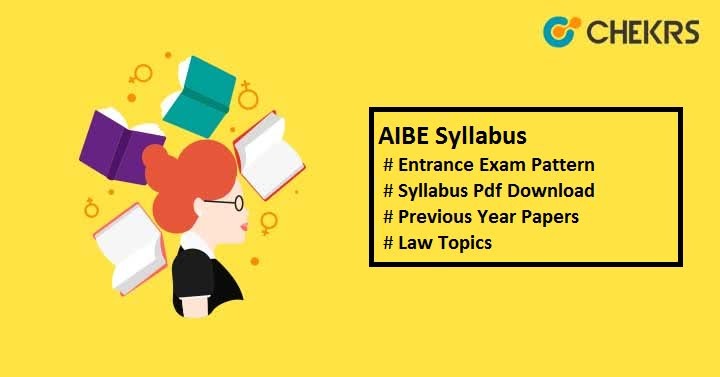 AIBE Syllabus 2019: Candidates desirous to get “Certification of Practice” in Law can apply for AIBE (13). Bar Council of India (BCI) has announced registration dates. If you are interested to appear in this test, you need to know the AIBE Exam Syllabus in detail along with the exam pattern. AIBE exam is an open book exam means you can carry relevant books or documents with you in the exam hall. To perform better in the exam, you need to collect all exam materials such as Important Books, AIBE Syllabus 2019, Notes, AIBE Exam Pattern etc. Here we have provided the important topics which need to be study to get good marks in the examination. Here we have also provided the Download Link to get the complete AIBE (13) 2019 Syllabus Pdf. Click on the given link to download the syllabus and start preparing for the exam accordingly. Marking Scheme 1 mark for each right answer with no negative marking. You can also check the AIBE Exam Previous Year Papers to get a rough idea of original question paper. After completing the exam syllabus, candidates can attempt Online Mock Tests for practicing the different type of questions. It will help you to increase your speed and accuracy and also help you in strengthen your exam preparation. For more queries regarding AIBE Exam 2019 Syllabus, leave your query in the comment box below. We will respond you very soon. All the Best!! !